I have decided that this is going to be the summer of the sangria. Why, you ask? I can't think of a single reason why not, so there you have it. I have been reading and reading plenty of mouth-watering recipes for Sangrias lately. In order to give some structure to this obsession, I have made an important decision in the name of science. I feel I need to try them all out, and then decide which one is best. But then, I will have to make it several times, in order to be sure that it remains consistently the best. Right? Come along as I check out some Sangria options. This first one is a white wine, citrus Sangria. 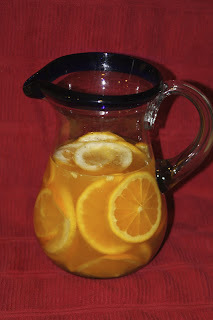 It's very light and the addition of fresh squeezed orange juice gives it a great flavor. However, if you are one (like me) who likes to dig in and eat the boozy fruit at the end of the glass, you may be disappointed. The orange slices are to die for, but the lemon slices aren't great snacking material. Slice one of the oranges and the lemon into 1/4 inch thick slices. Add them and the sugar to a pitcher. Muddle the fruit and sugar together until the sugar is mostly dissolved, but stop before the fruit is completely mutilated. 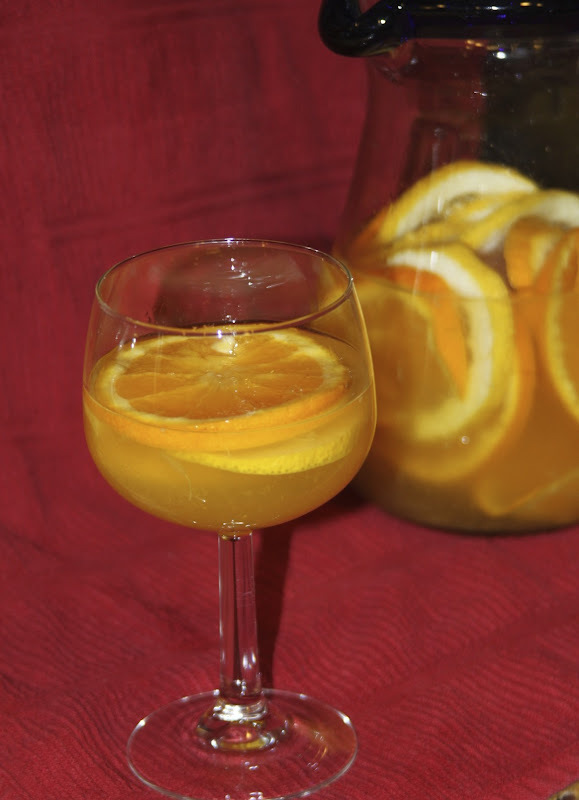 Juice the other orange, and stir in the orange juice, Cointreau, and wine. Chill for at least 2 hours, while you think of a great toast for a perfect summer evening. This can be poured over ice, if you wish.